So many people have nutrition questions out there regarding the busy long course endurance sports lifestyle, that instead of retyping the same recipe over and over, I thought I would post about it so it’s live for all time. 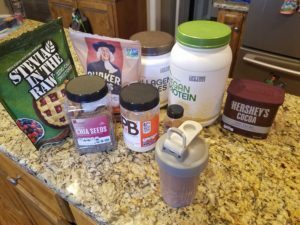 When you jam in that AM workout, then need to get ready, get the kids ready, feed the dog, take the trash out, get your gear in the car, drop kids off at school and then go to work, you don’t have time to fix a gourmet breakfast with all the nuances of the nutritional requirements you need and fast enough to not miss your golden window to refuel or be late to work… so you for those of you time starved and literally starving, I present…. MY OVERNIGHT OATS! Shake WELL and leave in fridge overnight. Add enough water/almond milk that the consistency is very fluid when you put it in the fridge. If not, it will be VERY thick in the morning as the oats and seeds absorb fluid and expand overnight. All you need to do is swing by the fridge and gran it after your workout on the way to the showers to start the day. Just keep sipping as you get ready and by the time you are ready to go, breakfast is done! AND, for you amazon prime people, all you have to do is add the items to your subscribe and save and it automatically refills every month and BAM, one less thing to worry about.